One of the major reason developers are ignoring standard technology languages like PHP, is the issues faced with the vigor and scalability of the platform. CakePHP is one such robust open-source web framework which is stealing the limelight due to its MVC (model–view–controller) approach, styled on the lines of Ruby on Rails. Even though the framework is based on PHP, it follows a completely refreshed workflow, thereby making the process of development, even more simpler. While Agile and Waterfall development approaches are popular amongst developers, the Rapid Application Development is gaining traction as it lays more emphasis on the processes involved rather than the planning. As such, it is an ideal approach for developing software that is driven by user interface requirements. CakePHP is a relatively new framework that provides a reliable base for Rapid Application Development in PHP. The framework follows the MVC (Model-View-Controller) architecture, thereby giving developers a more robust platform for developing apps. CakePHP supports automatic code generation using the console tool Bake, making it simpler for developers to develop web apps using Rapid Application Development. Additionally, the framework also supports dynamic scaffolding, which allows developers to define and create a primary application that can create, retrieve, update and delete objects. It also allows developers to define how objects are related to each other, and to develop and break those links. In this tutorial, we will use a MongoDB database to store the data to render the chart. 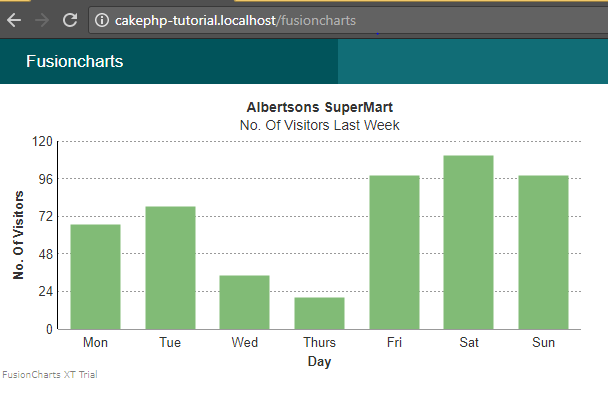 Without much ado, let’s get started on how we can use the CakePHP Framework with FusionCharts for creating charts. XAMPP (Server): We will use the XAMPP server for this tutorial. Although, you can use any other server that supports PHP and its frameworks like the MAMP server, the AMPPS server, etc. You can download XAMPP from here; it is available across all major platforms including Windows, OS X, and Linux. Read more about installing CakePHP and its packages. The required environment is ready with the CakePHP skeleton application. Now, we will embed our chart in it. In this step, we will define a virtual host for our application by adding the code given below in the httpd-vhost.conf file of our apache web server. Once we have made the changes in our config file, we will save the file and restart the server. We will now start our CakePHP skeleton application using this [http://cakephp-tutorial.localhost] URL to verify, we are on right path. After the successful installation, we will notice that cakePHP app is still not connected to the database. We need to modify the my_app\config\app.php file as shown below to establish the connection with the MySQL database. PHP wrapper : Download the FusionCharts PHP wrapper and extract. 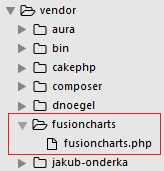 Find the fusioncharts.php file and keep that file inside the folder. Create the class FusionchartsController below in file src/Controller/FusionchartsController.php. 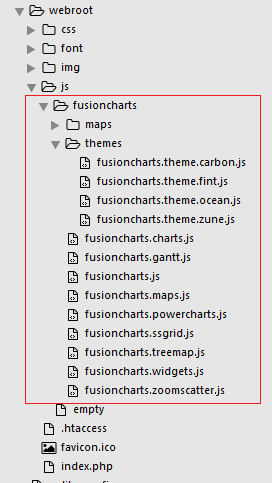 Start by creating a directory called Fusioncharts under src/Template/Fusioncharts. Now create the file Fusionchart/index.ctp. This will contain the code required to render the chart. If you see any errors in your code, click here to view the complete source code of the sample project we have created for this tutorial.